Posted Apr 16, 2019 by Eds. 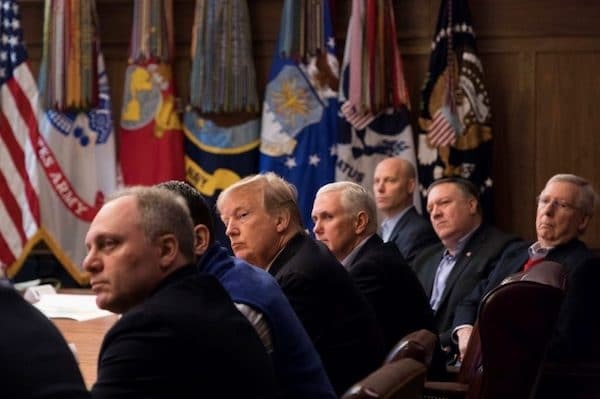 For President Donald J. Trump, there is only one goal in life–making money. Lowering taxes gives corporations and individuals more money; therefore, lower taxes must be beneficial. The constant self-serving references to his management of the economy are meaningless–examining President Trump’s essential thrusts for invigorating an already invigorated economy reveals contradictions in his Taxation Policies. President Trump signed the “Tax Cuts and Jobs Act” into law on December 22, 2017. His belief that reducing income tax rates automatically advances the economy is a shibboleth; a simple analysis exposes the fallacy. Some economists find subjective reasons for why lower income tax rates benefit the economy. Objectively, income tax rates only determine the transfer of money between government and taxpayers. Neither direction, up or down, adds or subtracts money to the economic system nor allows more or less available spending to the economy; purchasing power stays the same, which means the total purchases of goods and services remain the same. 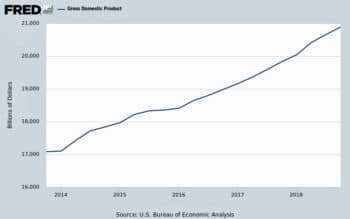 One exception–unlike the consumer who cannot accumulate vast funds for sizable investments, the government can temporarily postpone consumer spending, aggregate billions of dollars, and channel these funds into huge projects that add to the Gross Domestic Product (GDP). As one example, the government uses an accumulation of taxes to initiate construction projects. The suppliers to the projects hire workers, and the total wages paid the workers almost matches the taxes raised for the effort. Spending by the new wage earners ripples through the economy, and, in its final appearance, almost matches the reduced consumer spending of the taxed individuals. Consumer spending stays about the same, but money circulates through other channels. Employment, production (new constructions), and GDP increase—give one advantage to tax increases. Individual workers and taxpayers benefit from tax cuts; however, stimulating the entire economy by income tax breaks is a psychological phenomenon. The exaggerations, promises, and optimism generated by tax breaks fashion a more optimistic public that incorrectly assumes they stimulate additional spending to already combined consumer and government spending. Creeping into the debate are other false assumptions—those who have excess funds will purchase domestic goods, invest, and stimulate growth. 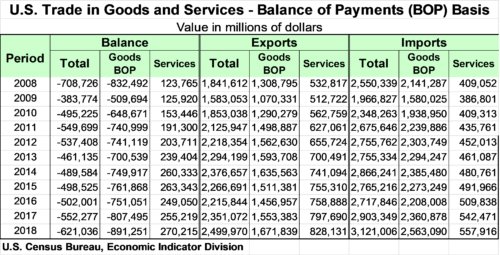 Not considered is that individuals might purchase imports, invest in speculative ventures that only churn money, and decrease available purchasing power in the domestic economy. The latter seems to have been one result from the tax cuts. New York Times, March 6, 2018, “In Blow to Trump, America’s Trade Deficit in Goods Hits Record $891 Billion”. If those who protest vociferously against the ever increasing government debt and its burden to future generations want to ameliorate their children’s problems, why don’t they pay their fair share of taxes now, which will lower the government debt and prevent higher taxes for their descendants in the future? Granted that overhauling an antiquated corporate tax structure could be advantageous to the economy. However, is it necessary for an economy that, despite supposed elevated corporate taxes, achieved great success, which included low unemployment and high corporate profits? Why fix something that was not broken and had no indication of being disrupted? If lowering corporation tax rates promoted more exports and investment, then its value is apparent. Has that happened? Analysis, statistics, and several charts answer the question. Corporations already paid less than 21% in taxes. One prominent feature of the “Tax Cuts and Jobs Act,” which should be factored into the assessment of the overhaul of the corporate tax structure, is the change from a global to a territorial tax system. Instead of corporations paying the difference between the U.S. tax rate and taxes already paid to the country where income was earned, each subsidiary now pays only taxes to the country in which it earns the income. Under new tax code Section 965, U.S. multinationals are required to pay a one-time “transition tax” on income accumulated overseas since 1986. The law treats the income as repatriated and imposes a 15.5 percent tax on cash or cash equivalents, and an 8 percent tax on illiquid assets, such as factories and equipment. This provision of the “Tax Act” may be the only tax reform that stimulated the economy. Observe corporation after tax profits (lower figure) during the last several years—companies had high profits, and sufficient funds for investment must have been available. Is the cutting of prices by 2.0%–4.0% sufficient to make products more competitive? Unlikely! Advantage from the more realistic 6 percent tax cut makes it more unlikely. Using repatriated profits to enrich stockholders might have merits–stockholders deserve benefits from their corporations and this benefit has an added significance. Unlike normal stock market trades, where money is exchanged and no new money enters the system, these stock buybacks took external funds and injected them into the domestic system, which increased the available money supply and purchasing power. It is difficult to assign a relation between tax cuts and Trade in Goods and Services. President Trump’s tariff policies add confusion to determining the causes for the trade deficit and how it was affected by tax cuts. 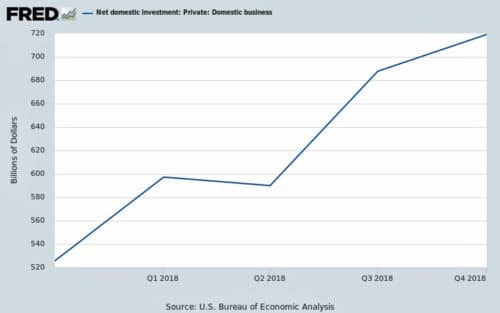 Clearly, despite President Trump’s stress on improving it, the tax cuts did not reverse the trend, and the trade deficit increased by a large margin ($69b) in year 2018. According to Department of the Treasury reports, corporate tax receipts fell by 28 percent–from $223 billion in 2017 to $162 billion during the first nine months of fiscal year 2018. 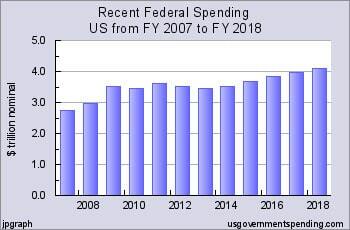 For that reason, as the following chart shows, the Federal Government deficit, which has increased in all of years of Trump’s presidency, increased by $114 billion. If $75b taxes had not been collected on the $500b of repatriated profits, the deficit would have increased by $189b. 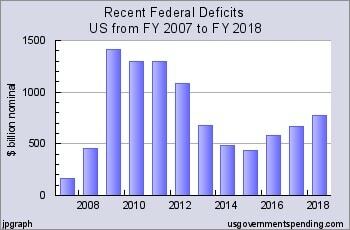 Because the defict increased, it can be argued that the deficit increase, caused by the tax cuts, stimulated the economy. 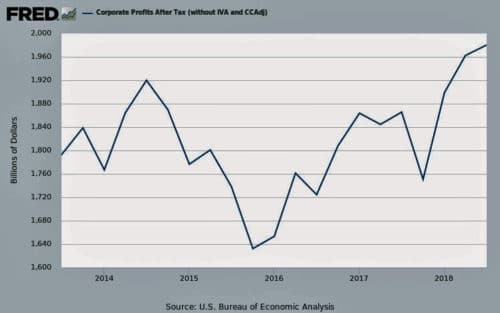 This indicates the tax cut are responsible for (1) increased after tax profits for already highly profitable corporations, (2) increased trade deficit, (3) about $80 billion loss (annualized) in government revenue, and (4) increased federal deficit to $114b. One more result–lowering of competition—corporations with large profits can use the funds to buy out and provide stiffer competition to corporations that have miniscule profits or losses. 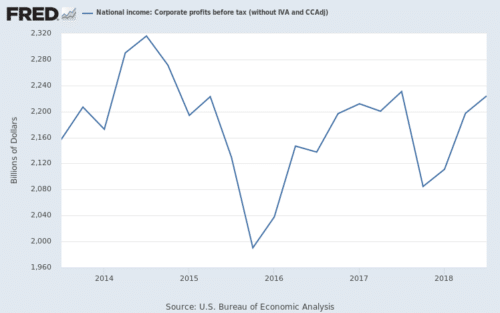 President Trump’s corporate and income tax cuts enriched corporations, satisfied those already employed and flush with money, and did little to stimulate the national economy.